Equip Cards are Bad. Parallel Port Armor is a Continuous Trap Card that equips upon activation to a targeted Link Monster you control. Then that monster can’t be targeted by effects of your opponent or destroyed in battle. The problem here is that Trap Cards are slow and Equip Cards are vulnerable. When this one hits the grave, it can banish itself and 2 Link Monsters to give a Link Monster you control two attacks. As I’ve said before defense doesn’t win games, so the first effect is nice but not necessary. The second effect is definitely nice offense, but it costs too much and is really not worth running. Parallel Port Armor just doesn’t justify the space in the armory. We are looking at the other Extreme Force preview card today, Parallel Port Armor. 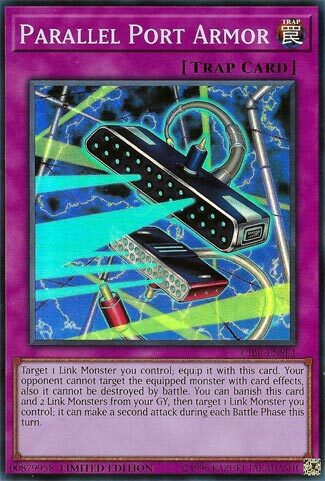 Parallel Port Armor is a Trap that can be equipped to a Link Monster you control, and it gives that Link Monster protection from targeting and battle destruction. It would be better for a Link monster to already have this protection built in, but at least you can have access to it with this card if it didn’t have it already. You can banish this card and two Links from the GY to allow a Link to attack twice during the Battle Phase this turn. More attacks is cool and all, but it does require Parallel Port Armor to be in the GY first along with two Link Monsters, it would of been better if it just immediately gave the Link a second attack. This is the better preview card in my opinion, but that isn’t really saying much. Part of the perks of playing for so long is immediately knowing when you’ve just seen something familiar. In the case of Parallel Port Armor, it’s pretty much “been there, done that.” It’s reached the point where you really begin to question why Konami on one hand creates intense, fast cards that seem to double the power creep in one go-around and then on the other hand creates insipidly boring cards that might never be used. And as most of us know, equip cards just don’t cut it. In fact, trap cards in general just don’t cut it. Nowadays, the best ones have to give insane plusses or somehow get around their inherent slowness (Evenly Matched). Now, I’m not saying Parallel Port Armor is terrible, but it’s slow. And much like its predecessors (Safe Zone, Gagaga Shield), it might have a good effect, but it seems to always lose out to something else. The only twist to Port Armor is that it has a mediocre graveyard effect, which is also a tool that’s been added to a lot of trap cards lately to help try and make them relevant. While the slowness of trap cards is a problem, the definitive main duress trap cards endure in the game of Yu-Gi-Oh is the glut of spell and trap removal available to players. If they were all done away with, trap cards would probably make a huge comeback. So, is this card playable? Probably not right now. At a certain point, if Link Monsters become an absolute dominant force in the vast majority of players’ extra decks (like Synchros and XYZ’s have gotten to at one point or another in the past), then this might be something worthwhile. But it’s certainly not good enough now.